Austin has long held a reputation for being a city of innovative creators. What better way to experience that history than on a bike and through the lens of art and architecture? On this tour, you will be guided through 130+ years of beautiful architectural history. You'll see the hidden jewels of art scattered in unexpected places. Among the stops, you'll visit iconic buildings such as the downtown Driskell Hotel and the Littlefield building. You'll visit the iconic UT Tower and the public arts on campus. And of course, no Austin architecture tour would be complete without a trip to the Capital Building. 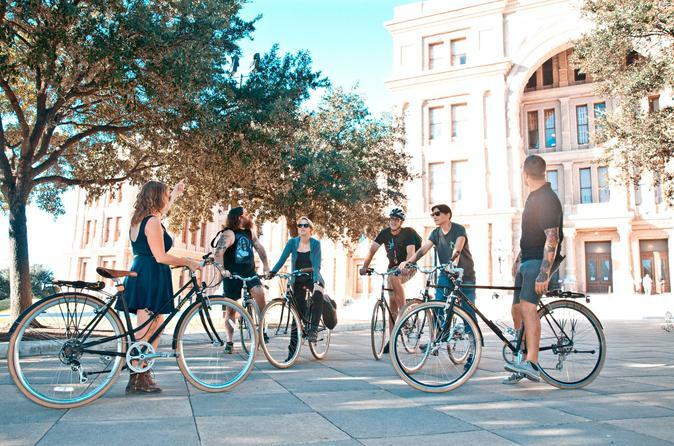 You'll learn some history, see some beautiful work, and have a great time riding your bike around beautiful Austin, TX. Take a ride through downtown Austin and the University of Texas campus to explore 150 years of architectural history and hidden artistic gems. You'll start downtown with an introduction to Austin's 31 year old Art in Public Places program then head to the beautiful 1886 Driskill Hotel on 6th Street. You'll get a chance to go in to this ornate landmark, learn how it came into being and some competitive histories for the buildings next door. Next, you'll ride up to the capital of Texas, in all its splendor, on your way to the University campus. Here you will have an introduction to the many museums and sculptures on campus. You'll discuss the iconic, innovative, and rumor laden history of the Main Building tower and visit an installation by the great James Turrell. On the way back, you will visit the Bremond block of wonderfully preserved Victorian houses before you round off the trip with the modern structures of the Federal Courthouse and City Hall. Come experience for yourself how Austin has preserved its structural history while still moving forward as a city of the future. This is a 3 hour tour. It is recommended that guests arrive 15 minutes early for an orientation before hitting the road. Make sure to wear comfortable clothing and closed toed shoes for biking and it is suggested to bring a bottle of water. The tour operator provides comfortable bikes with gears and hand brakes as well as a helmet which is optional.